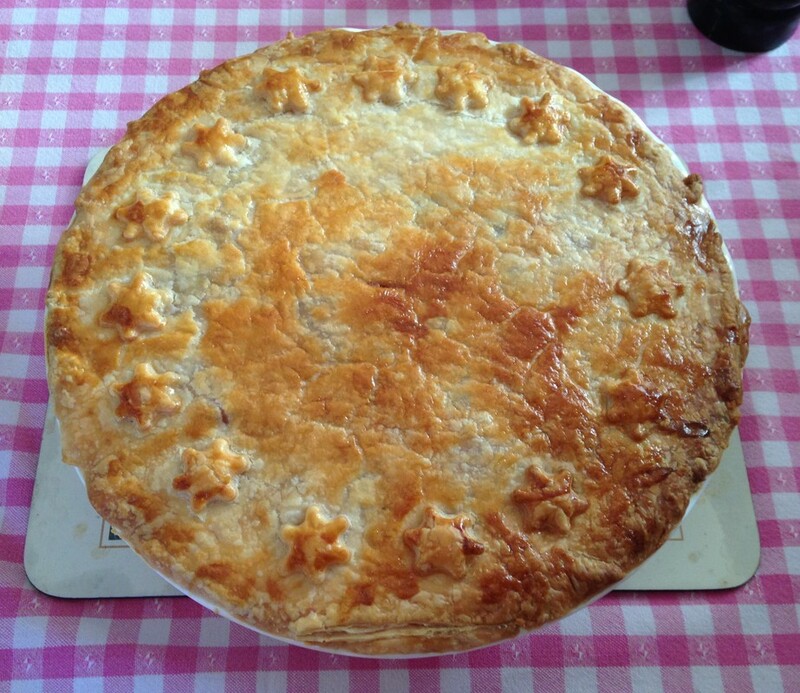 I love pies and I have always liked a chicken pie over a beef pie. I love pastry also, so for me this is a great dish. The first time I made this I was not sure if the filling would be as flavoursome as I liked, but was I shocked, it had so much flavour it was amazing. 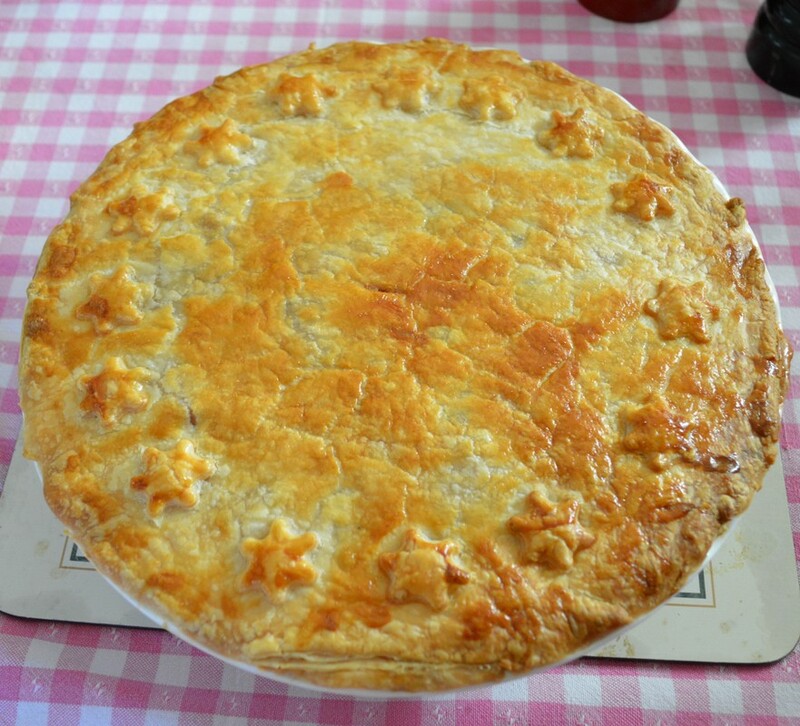 The original recipe was for small pies but I sometimes I like to make large ones when feeding my family. 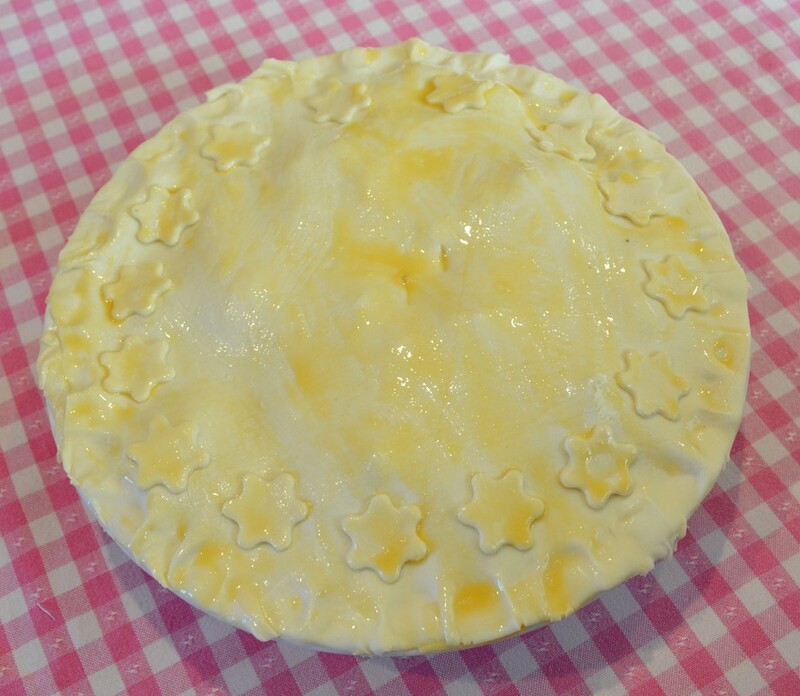 The recipe originally used store bought shortcrust pastry for the base. But I made the switch from store bought shortcrust to homemade shortcrust as I like it better, the pie is amazing with the homemade pastry and it is so easy to make. But if you are short on time, use the Careme brand of pastry for the base as it is superior to other brands. Store bought puff pastry is fine though. If you are making a large pie, you will have enough homemade pastry for the base and to use this pastry as your top also. It is great as a top to. The choice is yours. 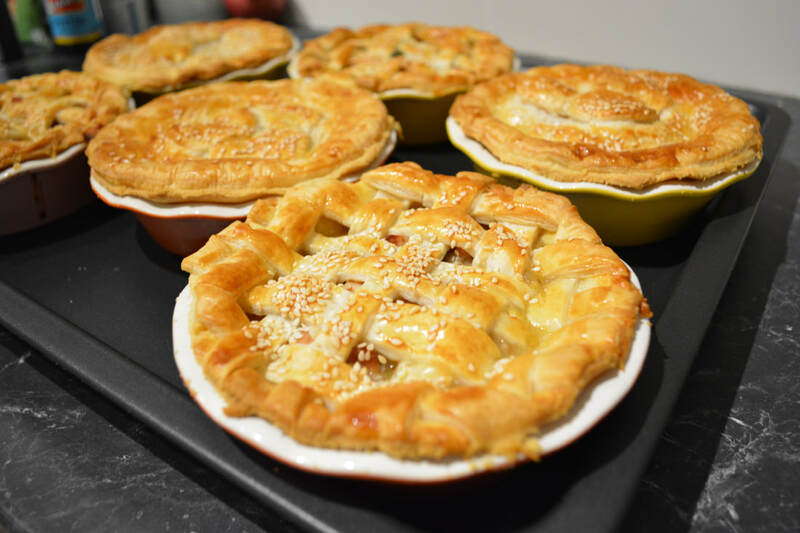 You can also just make 4 small pies with more filling in them, you don't need to make six, and then have two pies with a puff pastry top and two pies with the homemade pastry top as you will have some leftover pastry if you only make four pies. Make sure you allow 20-30 minutes resting time for the pie. If you serve large pies straight away, they will be too liquid inside. Allow the cooling time. So if you are looking for an easy pie recipe that tastes great, look no further. Heat oil in a large frying pan over medium-high heat. Add the chicken in batches, cooking for 5 minutes or until browned. Transfer to a bowl. Add the bacon, cook, stirring, until golden. Add the onion, garlic and mushrooms. Cook until the mushrooms soften. 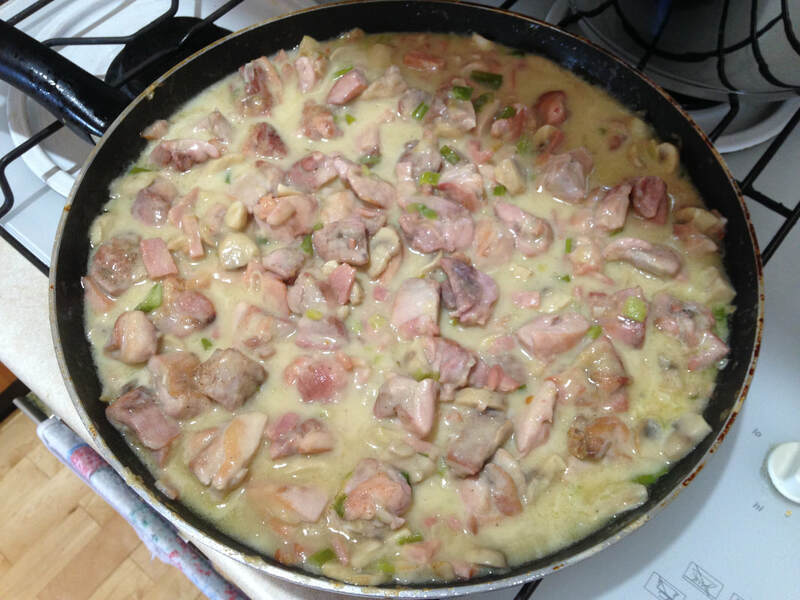 Return the chicken to the pan, add the flour, cook, stirring, for 1 minute. Add the stock, season with salt and white pepper. Reduce the heat to low. Cover the fry pan, simmer for 15 minutes or until the sauce thickens. Stir in the cream, remove from heat, taste for seasoning, cool. Once cool, if you feel it is a little to liquid, just stir in a little more flour, until it is thicker. ​To make the pastry, place the butter and water in a medium sized saucepan over high heat and bring to the boil. Remove from heat and add the flour and salt until a smooth dough forms. Turn the dough onto a lightly floured surface and knead until smooth and elastic. I kneaded it until had cooled. 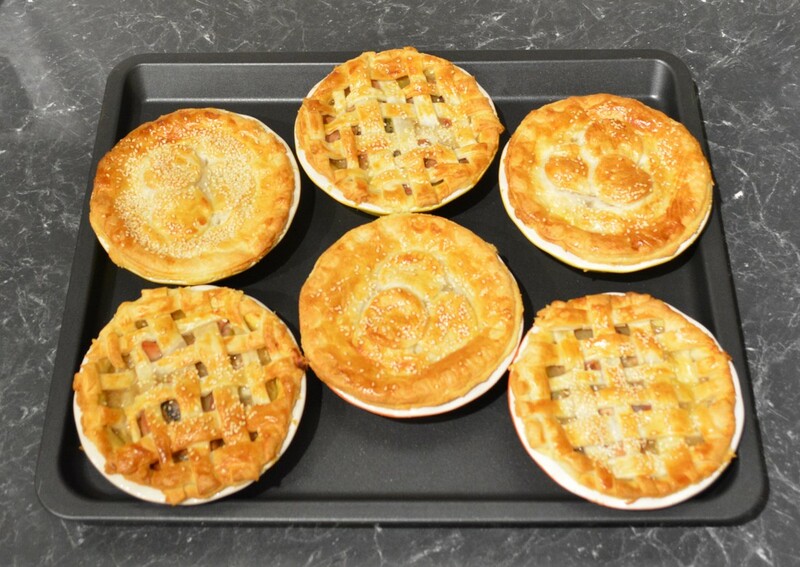 I make 4-6, 11cm (base) x 13cm (top) round pies. Lightly grease pie dishes. Divide the pastry into 6 even pieces. Roll the pastry out to 3mm thick. Line the pie dishes with the pastry, make sure you go up the sides and over the rim. Brush the pastry rims of the pies with some beaten egg. Spoon the chicken filling evenly into the pie dishes. My pie dish was 17cm (base) x 23cm (top), use what you have. Lightly grease the pie dish. If you are making one large pie, roll the dough into a circle 3mm thick that is large enough to cover the pie dish up the sides and over the rim. Place in a lightly greased pie dish. Brush the pastry rim of the pie with some beaten egg. Spoon chicken filling into the pie dish. 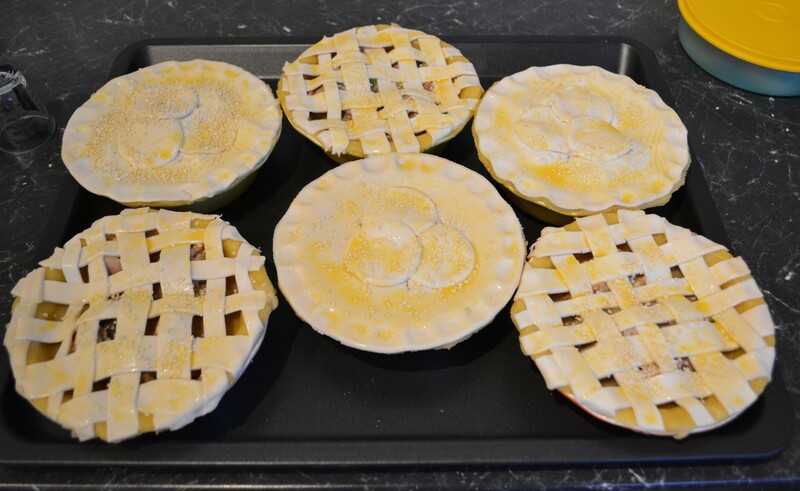 Cut out one circle from each of the three puff pastry sheets that will be large enough to cover your pie dish. With the remainder of the pastry sheet, I cut it up into strips and lattice the pastry, I do this so I have no waste. You will have a small square of leftover pastry, cut out shapes and stick them on your whole rounds as decoration. Pinch the pastry to the side of the pie dish to seal, make sure there are no gaps. Trim edge of pie carefully with a knife. Place 1 sheet of puff pastry over the filling, if not big enough, join an addition sheet to the pastry. 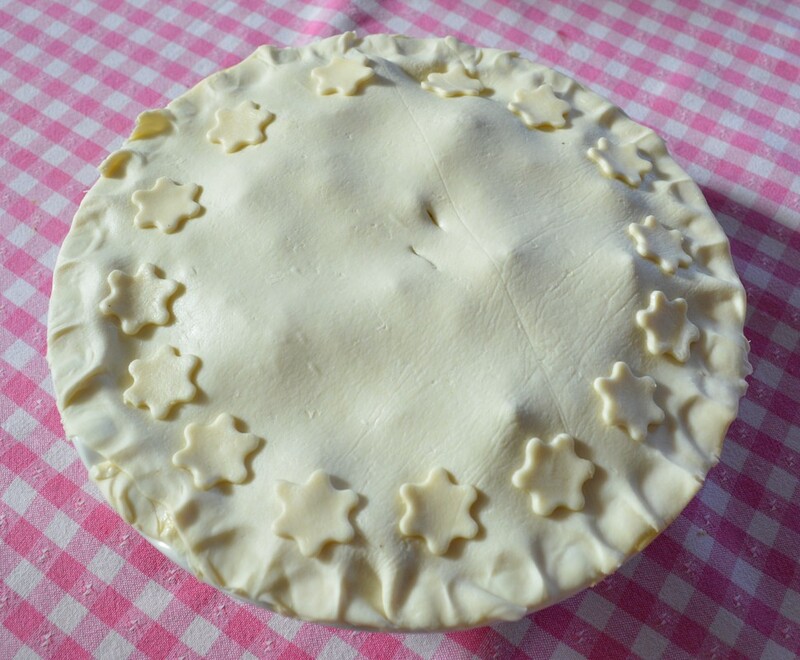 Cut out decorations from the leftover pastry and decorate your pie, hide any joins. Brush pastry with egg. Sprinkle with sesame seeds if using. Bake for 30 minutes or until golden and puffed.